Any way you slice it, the template for the mellow sounds that dominated AM radio in the 1970s starts with Baby I’m-A Want You. Bread’s finest effort stands the test of time by way of the band’s sturdy melodies, the former studio professionals’ finessed playing, and some of the choicest harmonizing to ever come out of Los Angeles. Anchored by four Top 40 hits, the pop-rock classic radiates with golden-hued textures and pitch-perfect tones – particularly on this long-overdue analog reissue. Mastered from the original master tapes, pressed at RTI, and strictly limited to 3,000 copies, Mobile Fidelity’s numbered-edition 180g vinyl LP delivers engrossing levels of warmth, nuance, and smoothness that elevate Bread’s 1972 release to audiophile heights. For the first time, the quartet’s polished musicianship and vocal blends come across as if you’re hearing them happen live in the studio. Previously muddled elements are clarified, and the band’s choruses and treble-ringing notes opened up so they can fully blossom, pulling you closer to the combination of serious emotion and comically infused romance. In particular, leader David Gates’ quasi-falsetto and other vocal touches get their just due. The evidence arrives in the form of a quartet of songs that dominated the Billboard Top 100 charts – the title track (which climbed to #3), “Everything I Own,” “Diary,” and “Mother Freedom.” Throughout, melodramatic strains, complementary keyboard lines, and a fine equilibrium of poised grit and well-crafted instrumentation dot the music with sequin-like detail that glistens anew and rewards repeat listening. 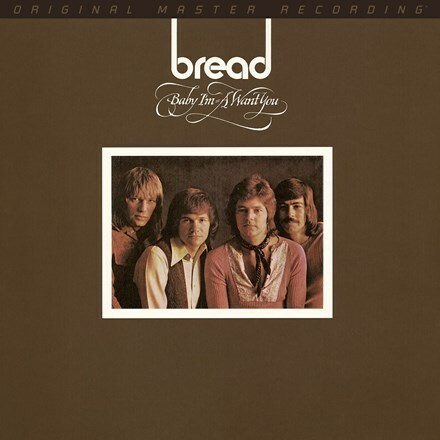 Bread’s mix of sentimental ballads and revved-up rock tracks (“Down on My Knees,” “Nobody Like You”) furthers the appeal of a record teeming with sweet and sour flavors. It’s also worth mentioning Baby I’m-A Want You marks the first appearance of Grammy-winning pianist/organist Jimmy Knechtel on a Bread album. Together with Gates, guitarist and Academy Award-winner Jimmy Griffin, and in-the-pocket drummer Mike Botts, Knechtel gives the quartet the butter its songs need – and the ingredients missing from some of its earlier work. Puns aside, the delicious back beats, buzzing guitars, complementary keyboard runs, and steadying bass evident on every track serve to confirm all 12 songs are bread winners – literally and figuratively. And the music is perfectly safe for gluten-free listeners, too!